This article by our SVP of Research, TS Kelly, originally appeared in Drug Store News. There’s no such thing as ordinary toothpaste. That’s one of the first things a Colgate commercial will tell you—and when it comes to toothpaste advertising, it’s true. Toothpaste is now a Swiss army knife problem-solver. It should do things like eliminate bacteria (so you’re ready for bear hugs), whiten (so you can let yourself swish that red wine), or reduce sensitivity (so you can enjoy ice cream again). 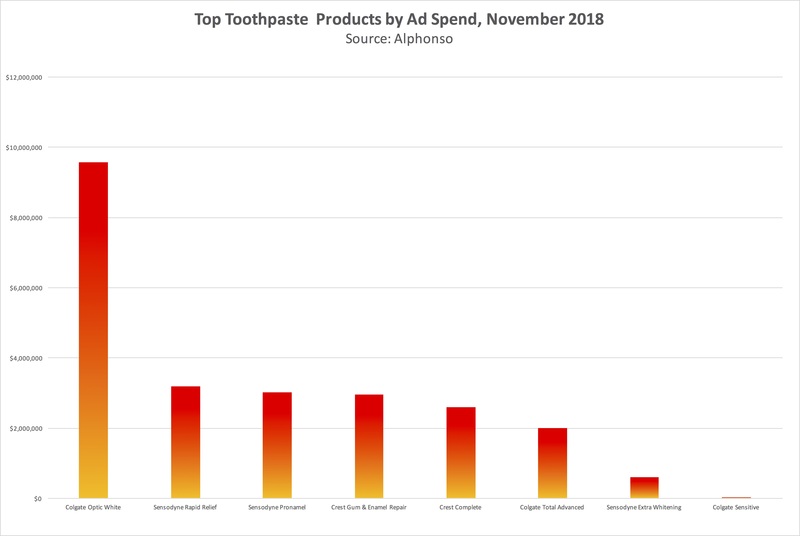 In November—a month famous for eating—top toothpaste brands spent millions of dollars on TV advertising vying to be consumers’ choice for solving their biggest teeth problems. Whitening saw the most investment from brands with more than $12 million on television advertising space in November alone. The biggest spender was Colgate. It dedicated $9.6 million to television media for its Optic White product, making Colgate also the biggest TV spender of all toothpaste brands in the month, according to data from Alphonso. Ads for Optic White ran everywhere, on hundreds of different shows across the main broadcast networks, top-tier cable channels, and many others. The brand also doubled-down on its influence with celebrity. It hired Food Network celebrity and educator Alton Brown to teach viewers, chalk board and all, how Optic White works. Gum-health and bacteria problems came in second. In November, Crest invested the most on its new product Crest Gum Detoxify. For it, brand spent nearly $3 million on television advertising space, with the vast majority of airings on MTV’s Ridiculousness, raising awareness about gum pain and the dangers of gum bacteria. Meanwhile, Colgate spent nearly $2 million on TV ad space to promote Colgate Total Advanced, a 12-hour bacteria fighter on teeth, tongue, cheeks, and you guessed it—gums, too. The one-two punch however may have come from Sensodyne. Sensodyne is synonymous with relieving tooth sensitivity. It spent $6.8 million on television space in November across its brands. The kicker? It has a whitening toothpaste. Whitening plus sensitivity relief: That’s two distinct problems solved with one tube. As for media, Sensodyne invested uniquely and strategically skipping the usual array of cable networks, and spending only on CBS, NBC, ABC, FOX, CW, and the Oprah Winfrey Network. Independent of TV ad buying strategies, the overall toothpaste M.O. is clear. Resonate with consumers by purporting to solve the issues they themselves can identify like yellow teeth, painful gums, bad breath, sensitivity. As for what’s really causing all of America’s problems with their pearly whites? Leave that for the dentist.